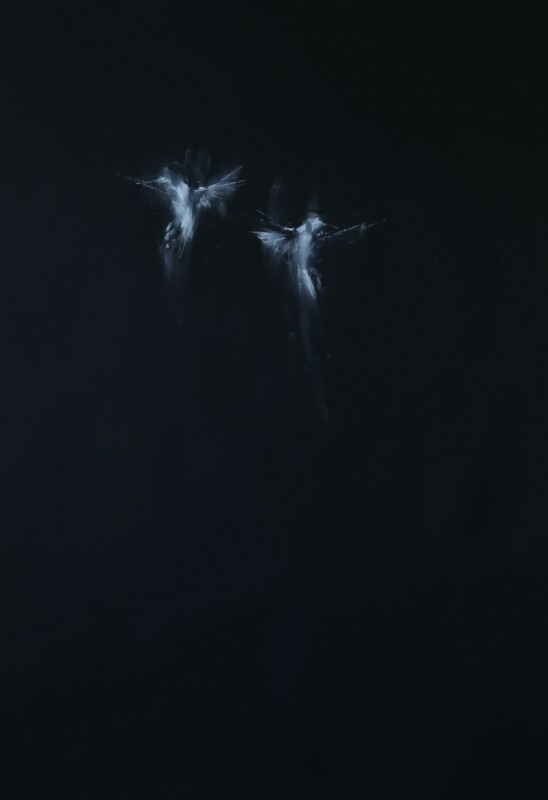 This solo exhibition of work from Jake Wood-Evans showcases a range of original drawings alongside new oils. They depict a collection of creatures, from birds to stags to humans, all of whom glow with an eerie inner luminosity. Using a mix of materials, the artist gives an ethereal, intangible quality to each piece so that they reach out to the viewer and demand further contemplation. However it is work that is much more than simple contrast. Delicate areas of marksmanship peek through mists of chalk and scores of disruption that agitate each piece in a different way. The works give the impression of imprints - a birds wing beats against the dust, marking the page - a fleeting moment suspended. The serenity and elegance of the subjects are given a mysterious and haunting quality. The collection as a whole provides an opportunity for the viewer to enter a world where moments are frozen in stunning beauty. We catch the eye of a deer before it darts again out of sight, faces struck by emotion are paused momentarily, inviting us to explore them and attempt our own decoding. The works in turn slow us down and draw us in, encouraging us to absorb and explore not only the whole composition but also the individual elements of beauty and emotion within each piece. The impossibility of completely grabbing and preserving a moment is revealed, the light burns bright before it fades, the image is prone to being rubbed away, we are looking in on the past just as time slips by us. Jake says;‘For me it’s not about perfect representation but about conveying an emotional atmosphere within the work. When I look at paintings, I like to see the artists’ hand, that’s the poetry. Reading these gestures provides a glimpse of the artist’s journey. My process is quite often about small moments of chaos that leave a trace. I stop when I feel there is enough information to be seductive, but equally enough left absent or ambiguous to imagine what is missing’. Within the show, contemporary melds with the past as modern inspirations and compositions retain the quality and atmosphere of the Old Masters that so inspire this artist. His obsession with classical painting and craftsmanship is still abundantly apparent, as is his growing confidence in the development of his own artistic language — unpicking and peeling away meticulously built layers of detail. Bold marks and brushes expose the artists own instinctive practice. Through experimentation with different surfaces and materials, what emerges through consideration of this new body of work is further confirmation of Jake Wood-Evan’s signature style. His language is one of light and luminosity. Born in 1980 in Devon, Jake graduated from Falmouth University with a BA Hons in Fine Art. Based in Brighton for a number of years, he currently lives and works in Hastings. Jake has exhibited across the UK in numerous group and solo exhibitions. He also participates in art fairs and his work is collected internationally.